Since 2001, Curtis Ferguson II has held a number of appointments at various colleges and universities across the United States. Although each of these institutions have been distinct, they all share a common characteristic—they’re predominantly White institutions (PWI). Through college admissions, Curtis wants to create a higher education landscape at PWIs that values pluralism through a greater representation of multicultural students. For Curtis, advocacy has been more than just a value: it has been a way of life. Even as an undergraduate student at Oberlin College, Curtis was heavily involved in campaign groups and multicultural outreach. 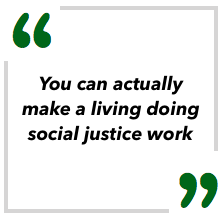 On campus, he was a tour guide, resident advisor, and the coordinator for the Raise Your Voice campaign, an initiative through Campus Compact to educate students about civic engagement. Curtis also relates his scholarship in classical civilizations to his current advocacy work in admissions. Right now, Curtis serves as an Associate Director of Admissions at DePauw University. In this role, he converts eager high school students into engaged college students by helping them find a sense of belonging. He coordinates multicultural recruitment for the university – an endeavor disheartening to some, but one Curtis finds empowering and rewarding. 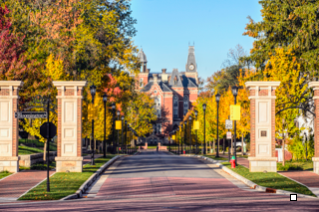 As the multicultural recruiter for DePauw, Curtis is able to share this and similar advice with students throughout the United States and across the world. From the Deep South to South Korea to Pakistan, Curtis is opening the eyes of multicultural students from around the globe to the opportunities that a liberal arts education can afford them. It is his ultimate goal to help every student he encounters find their niche, both academically and professionally. Curtis loves working in admissions and intends to remain in the field for the rest of his career. His dream job is to eventually become the Dean of Admissions at a small institution (especially PWI) with a liberal arts curriculum. In this role, Curtis hopes to challenge traditional ideas about access, persistence, and success in higher education.